Taking their name from the Samuel R. Delaney's apocalyptic sci-fi classic, Sam Wagster (Fruit Bats, The Singleman Affair) and Dan Mohr (DRMWPN et. al.) 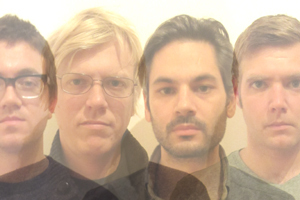 formed Dhalgren in 2010 as an outlet to explore ambient improvisation. In 2011, they expanded their personnel, adding Adam Vida (Singer, US Maple) and Alex Inglizian (El is a Sound of Joy). The new four-piece's sound is rich and textured, with all four members contributing to a complex base of synth drone and processed vocals, under which a driving rhythm section occasionally appears to propel the music from dense ambience to ecstatic motorik synth rock.